The Folk Arts Center of New England relies on the generosity and energy of our many volunteers, friends, and their families to sustain our goals. With the launch of our new online auction, we expand the opportunities for participation and support of these goals. 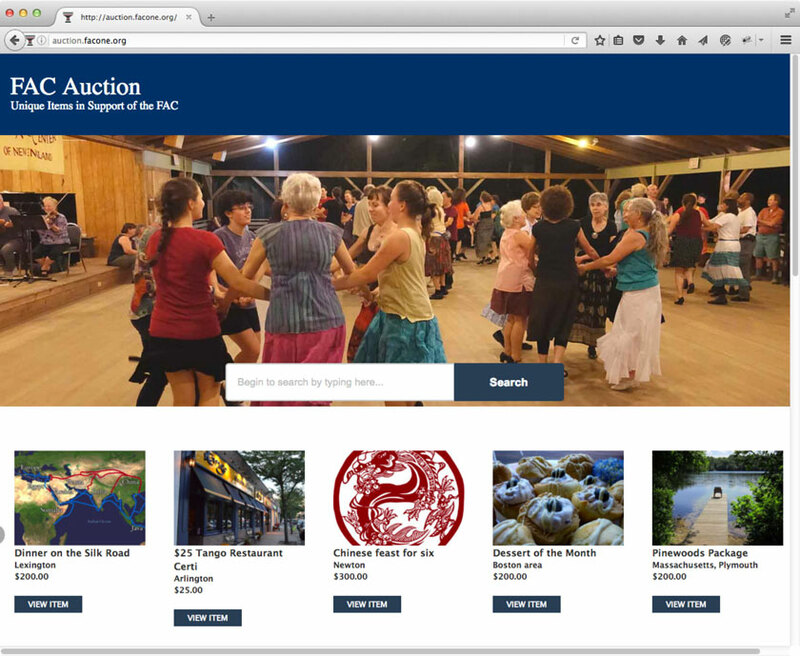 Sponsored by the FAC Gala Committee, the online auction offers a wide variety of goods, services, and experiences to the greater FAC community. New items will be added often, so check the site frequently! The auction opens on Thursday, November 15, 2018 and closes on Sunday, March 31, 2019.
admission to lodging or dining. To submit an item to the auction or bid on an existing item, you’ll need to create an account for yourself as a subscriber. Please review the item requirements and then get started! The auction home page shows a sliding carousel of the auction items. To see all items in list view, click on any item and then select All Auctions in the main menu.